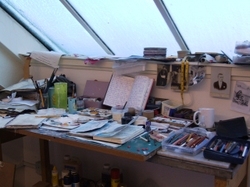 Wow... you truly are blessed to have a studio to work in! I make do with a table in front of the piano, in the corner of our living room. In my dreams, i have a fabulous studio with stereo sound speakers and fully stocked :). One day.,.. 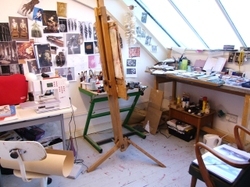 You are so lucky to have such a light and roomy studio! I can see how working out of the home can be uplifting, too! I share my space with our washer & dryer and once a week I'm evicted when clothes are hanging on the lines! Oh...super studio! I want your light...and your space...but most of all your light.